The 2019 online catalog was posted January 1st and is valid until mid- August. There are some beautiful peonies offered for the first time on the list for 2019. Previews, photos and updates will be posted on our Facebook page. Some items sell out quickly when the catalog is first posted and more sell out as the bloom season arrives. Payment is processed at the time you place your order to reserve your plants. 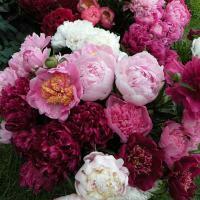 Peonies listed as LIMITED are expected to sell out and are scheduled for propagation this fall for harvest in fall of 2023. Have fun shopping and thank you for your order!